There aren’t many people who have spent the past four decades doing something they love. Nowadays, they’re in the minority, and are the lucky ones. Award winning singer-songwriter Boo Hewerdine is one of the lucky ones, and has been fortunate enough to spend the last four decades fulfilling what was once a dream. This dream began as a seven year old, when Boo Hewerdine was given a handful of singles and a Dansette record player. He remembers: “I would study the labels. The title, the singer, the numbers, Columbia, HMV, the stuff about rights written around the edge and most intriguing–the names in the brackets. It turned out that these people had “written” these songs. Songs could be made up. Conjured out of thin air. I decided then, at the age of seven, that’s what I would do. I couldn’t sing or play an instrument but I had an internal jukebox going on the whole time.” This Boo Hewerdine would put to good use in the future. By the time Boo Hewerdine left school a decade later, he had mastered the guitar and was an aspiring singer-songwriter. Despite his ambition and aspirations, Boo Hewerdine ended up working in the warehouse of Andy Records’ in Bury. St. Edmunds. However, Boo Hewerdine always had ambition beyond working in a record shop. This first materialised when he formed his first band with a friend. Placebo Thing may have been a short-lived band, but it gave Boo a tantalising taste of life as a musician. Suddenly, he wanted to be making records rather than selling them. Boo Hewerdine made his recording debut thirty-five years ago with The Great Divide. Four decades later, and Boo Hewerdine is regarded as one Britain’s leading singer-songwriters. He will release his much anticipated solo album Swimming In Mercury, on Reveal Records on ‘28th’ 2017. It’s a very personal, insightful and autobiographical album, with Boo Hewerdine reflecting on the past on Swimming In Mercury. There’s been much for Boo Hewerdine to reflect on during a career that’s spanned four decades. Fortunately, he didn’t have long wait. Boo Hewerdine joined The Great Divide in the early eighties. They were another local band, but one that looked as if they were going places. By 1982, The Great Divide had signed to a local Cambridge label, Wimp Records. Twenty-one year old Boo Hewerdine made his debut on the single Who Broke the Love Bank. Not long after this, The Great Divide caught a break, when Mike Scott of The Waterboys heard the band. He thought that The Great Divide had potential, so recommended them Ensign Records. Executives at Ensign Records agreed, and signed The Great Divide. They went on to release a trio of singles on Ensign Records. Alas, commercial success eluded these singles. By 1985, Boo Hewerdine was back where it all started for him. With The Great Divide consigned to musical history, Boo Hewerdine was back working in a record shop in 1985. This time, Boo Hewerdine was behind the counter of the Beat Goes On record shop in Cambridge. While this allowed Boo to be around music, he hadn’t given up on his dream of making a living as a musician. So when Boo met jazz drummer Tony Shepherd, it looked like his time behind the counter could be coming to an end. Originally, Tony Shepherd was a jazz drummer when he met Boo Hewerdine. While Tony sat in with other bands, he was like Boo, between bands. So the pair decided to form a new band, and The Bible were born. They drafted in Kevin Flanagan another former member of The Great Divide. Before long, The Bible began to make an impression locally. Soon, The Bible were a popular band locally. They had quickly acquired a cult following. Word began to spread further afield about this new band from Cambridge. This was through word-of-mouth. So it was no surprise that a record company decided to sign The Bible. The label that signed The Bible was Black Records, a Norwich based independent label. They released The Great Divide’s 1986 debut album Walking The Ghost Back Home. It reached number ten in the UK Indie Charts, and featured two hit singles. Graceland reached number eighty-seven in UK charts, before Mahalia reached number fifteen in the UK Indie Charts. Given the success of Walking The Ghost Back Home, it was no surprise that bigger record labels started to take an interest The Bible. Eventually, The Bible decided to sign to Chrysalis. They began work on their sophomore album Eureka. The Great Divide had decided to produce the album with Pete Smith and Owen Morris. However, the initial sessions proved unsatisfactory for the band. It was then that their management suggested bringing country rocker Steve Earle onboard to produce Eureka. This worked, and the album was scheduled for release in 1988. Prior to the release, the reviews of Eureka were positive. Despite this, the album stalled at just seven-one in the UK. For everyone involved, this was disappointing, considering how popular The Bible were. Surely this was a blip? Just a year later, The Bible enjoyed the most successful single of their career. A rerecorded version of Graceland reached fifty-one in the UK. It looked like things were improving for them. Then Honey Be Good reached fifty-four in the UK. However, when The Bible released their third album Dodo, it failed to chart. Things were set to get even worse. A year later, and The Bible split-up in 1990. After five years together, and a lineup that’s best described as fluid, it looked like the end of the road for The Bible. It wasn’t. Since then, The Bible have reformed twice. The first time came in 1994, and the second in 2011. However, then Boo Hewerdine was a successful solo artist. Boo Hewerdine and Darden Smith-Evidence. Once The Bible split-up, Boo Hewerdine decided to concentrate on his solo career. He knew the direction his career was heading. A meeting a year earlier had influenced the direction his music was about to head in. This meeting took place in 1989, while The Bible were still together. That was when an A&R executive introduced him to New Country singer Darden Smith. The two realising they had much in common, decided to write and record an album together. Time was short though. Somehow, Darden Smith and Boo Hewerdine managed to write and record an album in just nine days. This album became Evidence, which was released to critical acclaim in 1989. This was the first, but not the last time Boo would collaborate with other artists. By then, he would be a solo. Now that The Bible had split-up, Boo Hewerdine embarked upon a solo career. This solo career began in 1990. Since then, Boo has released a string of E.P.s. and will soon release his ninth album Swimming In Mercury. Two years after the demise of The Bible, Boo Hewerdine released his debut album Ignorance in 1992. Critical acclaim accompanied the release Ignorance. It was a much anticipated and highly accomplished album of carefully crafted songs. However, three years would pass before the followup was released. The reason for the delay, was that by then, Boo Hewerdine was writing for other artists. This included writing for Eddi Reader and Clive Gregson’s 1993 album Wonderful Lie. Since then, Boo has written songs for many successful artists, including KD Lang, Kris Drever, David McAlmont, Natalie Imbruglia and Alex Parks. However, this sometimes curtailed his ability to release albums quickly. It wasn’t until 1995 that Boo Hewerdine returned with his sophomore album Worlds End. Just like Ignorance, praise and plaudits accompanied the release of World’s End. Buoyed by the response and success of World’s End, Boo released Baptist Hospital in 1996. Some critics felt that was the best album of Boo’s career. With album he seemed to be maturing and growing as a singer and songwriter. Like a fine wine, Boo was maturing with age. So when Nick Hornby was looking for someone to write the soundtrack to the film adaptation of his book Fever Pitch, Boo got the call. The film was released in 1997, the same year that the film Twenty Four Seven was released. Boo and Neil MacColl had written the soundtrack. The other soundtrack that Boo penned for the television film Our Boy. For Boo, writing for film and television was a whole new world, and one he would return to later. Before that, Boo released a new solo album. Three years had passed since Boo Hewerdine had released Baptist Hospital in 1996. He returned in 1999 with his fourth album Thanksgiving. It featured a guest appearance by Martha Wainwright. By then, Boo’s music was reaching a wider audience. That wasn’t surprising given the quality of songs on Thanksgiving. The Birds Are Leaving, Hope Is A Name, Our Boy, Homesick Son and A Long Winter showcased a talented singer, songwriter and storyteller. However, in 2002, Boo added another string to his bow. This came about when Boo Hewerdine was asked to co-produce Eddie Reader’s album Angels and Electricity. Boo had written a number of songs for Eddi, but was now co-producing her albums. Soon, Boo was producing The Corrs, Heidi Talbot and Chris Difford. Along with his work as a songwriter, Boo was constantly busy. Sometimes, his solo career seemed to take a backseat. However, in 2001, Boo’s contribution to music was recognised. In 2001, Boo Hewerdine was named as the Performing Rights Society’s songwriter in residence at The Song’s The Thing concert series in London. Boo had come a long way from when he was working in a record shop warehouse and about to form his first band. Now he was regarded as one of Britain’s top songwriters. He took to the stage during one of The Song’s The Thing concerts, and got the opportunity to showcase his skills as a singer and a songwriter. However, another opportunity for Boo to showcase his songwriting skills arose during 2001. This came when Boo returned to the world of soundtracks. One of his songs featured in Christine Lahti‘s My First Mister. For Boo, this meant a whole new audience would hear his music. This couldn’t have happened at a better time, as Boo would released a new album in 2002. Anon, which was released in 2002, was Boo Hewerdine’s first album of the new millennia. By then, Boo’s star was in the ascendancy. It seemed that every album he released was welcomed with open arms by admiring critics. His new album Anon was no different. Boo was consistently releasing albums of carefully crafted, thought provoking songs. That continued to be the case. When Eddi Reader entered the studio to record her critically acclaimed album Sings The Songs Of Robert Burns, Boo Hewerdine was drafted in to co-produce the album. The result was one of the most successful albums of Eddi Reader’s career. It found favour with Burns aficionados across the world. Buoyed by the success of Sings The Songs Of Robert Burns. 2003 had been a good year for Boo. It got even better when Boo’s song Different God was chosen to feature on the soundtrack to the film Intermission. After such a successful year, Boo’s thoughts began to turn to his solo career. Two years later, and Boo Hewerdine returned with a new album in 2005. This was his sixth album, Harmonograph. Boo it seemed had the Midas touch, and critics heaped praise on Harmonograph. However, Boo it seemed, was in no rush to release a followup. That wasn’t surprising. Boo Hewerdine now spending more time writing songs for other artists. He was also in demand as a producer. He also recorded a comeback album with The Bible. Money and Time was released in 2007. However, Boo hadn’t turned his back on his solo career. Still, though, he found time to play live, and when he had the time, headed into the studio. The fruits of his most recent sessions were his seventh album God Bless The Pretty Things. It was released in 2009, and just like the albums the had preceded it, was well received by the critics. They lavished praise on God Bless the Pretty Things, which was a welcome, and some felt overdue addition to Boo’s back-catalogue. Little did they realise it would be six years before Boo Hewerdine released another album. During that period featured on State Of The Union’s two albums. He wrote much of their eponymous debut album and shared the lead vocals with Brook Williams. This was the case when State Of The Union released their 2012 sophomore album Snake Oil. These albums weren’t the only albums Boo worked on. When Kris Drever was recording his solo album Last Man Standing, Boo featured on the album. Last Man Standing was released in 2015, the same year that Boo released his long-awaited comeback album. Open was released in 2015, and found Boo Hewerdine crowned the comeback King. He may have been six years since his last solo album, but the fifty-three year old’s comeback album had been well worth the wait. Critical acclaim accompanied the release of Open. However, Boo’s fans wondered when they would hear from Boo again? Little did they realise it would be so soon. Just a year later, in 2016, Boo Hewerdine returned with The Born E.P. This the first E.P. that Boo has released since Toy Box No. 2 in 2008. However, the Born E.P. was a very personal collection of songs. It was a collaboration between Boo Hewerdine and his son Ben. They penned five songs, including The Year I Was Born and Swimming In Mercury. They were a tantalising taste of what was in store on Boo Hewerdine’s ninth album Swimming In Mercury. Boo Hewerdine made his recording debut thirty-five years ago with The Great Divide. Four decades later, and Boo Hewerdine is regarded as one Britain’s leading singer-songwriters. He will release his much anticipated solo album Swimming In Mercury on Reveal Records on ‘28th’ 2017. It’s a very personal, insightful and autobiographical album, with Boo Hewerdine reflecting on the past on Swimming In Mercury. There’s been much for Boo Hewerdine to reflect on during the past four decades. While The Born E.P. was a akin to a musical amuse bouche, Swimming In Mercury was the entree. It featured twelve new songs. Most of these songs were penned by Boo Hewerdine. That is apart from Swimming in Mercury which Boo and Ben Hewerdine cowrote. These twelve songs would eventually become Swimming in Mercury, which was recorded at Chris Pepper’s studio in Cambridge. Given Swimming in Mercury was an album of autobiographical music and memories, Boo Hewerdine decided to record the album in a very different way to recent albums. He recalls: “the new album was recorded in the spirit of the first four track recording I ever did… but instead of a chunky cassette deck we were able to use Chris Pepper’s Cambridge studio. It was an incredibly enjoyable and creative way to work. Often I would write a song in the morning and by the end of the day we would have another track done”. This was a very different approach to how most albums are recorded nowadays. In most studios, a Digital Audio Workstation (DAW), like Pro Tools or Logic is at the heart of most studios. They allow artists to use an unlimited amount of tracks. As a result, often 100-200 tracks are used to record a track. Not when Boo Hewerdine recorded Swimming in Mercury. He restricted himself to just four tracks. Still though, he was able to get his message across on Swimming in Mercury as he reflects on this past on what’s a very personal and autobiographical album. Satellite Town opens Swimming In Mercury. Stabs of a buzzing synth and organ usher in Boo’s vocal as memories come flooding back, of the life he once knew and lived. As he remembers his younger self, he sings “I live in a Satellite Town and I don’t mind,” harmonies, drums and synths are part of the carefully crafted arrangement. Soon, it floats dreamily along a bass and braying saxophone combining with a shimmering guitar. After a refrain of the introduction as Boo remembers: “and on the morning I said goodbye, nobody asked me why?” By then the arrangement is melodic, full of poppy hooks and has a narrative that paints pictures like The Beatles’ A Day In The Life. Later, the understated arrangement skips along, the rhythm section and glistening guitars accompanying Boo’s tender, thoughtful vocal, before a wash of feedback brings this irresistible and radio friendly track to crescendo. Drums reverberate on A Letter To My Younger Self as lo-fi keyboards usher in Boo’s vocal. Meanwhile, the bass and guitar join the arrangement as Boo reflects on what he would tell his younger self? “Let somebody love you” is the answer. Soon, a saxophone and punchy harmonies joins the carefully which continues to build. Later, when the vocal drops out, an ascending keyboard line adds to the energy of this melodic and hook laden song. Boo replicates the sound of an American TV show during the introduction. It gives way to oo’s vocal on this ballad, and soon, he’s reminiscing about “monochrome” Britain of the sixties, and California; “the American dream where the colours are so much brighter.” Meanwhile, a piano, rhythm section, acoustic guitar and Beach Boys influenced harmonies accompany, and compliment, Boo’s vocal as the memories come flooding back. He remembers how: “the colours were much brighter, California was a dream, a place I saw on American TV, back when I was a boy.” When Boo’s vocal drops out, wistful harmonies provide a backdrop before his vocal returns and the arrangement builds and reaches memorable and melodic crescendo. A clock chimes on Sleep, which Boo sings along to. Soon, the rhythm section and guitar play slowly and accompany Boo’s tender vocal as the arrangement flows along. Tender harmonies, keyboards and guitar accompany as Boo reflects: “life is a dream, and we dream our lives away” Later, Boo from the moment we are all born we’re marathon dancers who sway until dawn, until the music is done, everyone has to sleep.” By then, the arrangement waltzes thoughtfully along, as a ruminative Boo continues to reflect on life. A horn plays while drums pound urgently and a guitar glistens on Gemini. Soon, the arrangement builds and takes on a celebratory sound. It provides the backdrop for a joyous Boo whose found the ‘one’ he’s spent a lifetime searching for. “Gemini I know you think I’m mad, you were once in a dream I once had.” Bells ring, a horns sound and the drums march the arrangement along. Later, a searing guitar and lush strings are added to the celebratory sounding arrangement. They’re part of a hook-laden and joyous song from a musical master craftsman. The Boy Who Never Cried Wolf finds Boo remembering his school days, against a backdrop where a bubbling synth combines with percussion. This allows Boo’s vocal to take centre-stage, as he sings about doing what it took to fit it in. In Boo’s case; “I knew how to make them laugh, I was a holy fool. Ruefully, Boo reflects: “ I never told them the truth, I was The Boy Who Never Cried Wolf.” Meanwhile, the arrangement builds and frames Boo’s vocal. When his vocal drops out, a guitar replaces it. Still the bubbling synth provides the heartbeat to another autobiographical song. A drum pounds, as if replicating a heartbeat. It sets the scene for Boo’s piano. Soon, he’s delivering a tender, thoughtful vocal, as he reflects upon 1962, “The Year That I Was Born.” He sings of the Cold War, the Berlin Wall, President “Kennedy’s first State Of The Union Speech” and an uncertain future. Briefly, a bass synth pulsates, adding an element of drama. By then, Boo reflects upon “the trial in Jerusalem” and later, “the death of (Ernest) Hemingway.” Uncertainty and sadness it seems, are omnipresent as Boo’s vocal takes centre-stage. Meanwhile, the piano and synth play supporting roles. Later, Boo sings of “The Beatles in The Cavern, the cellar full of noise, all the post war girls and boys, in a world that might that explode.” Boo’s vocal is impassioned and heartfelt, before a vortex of ethereal, celestial sounds sit above the arrangement. Later, wonderment and hope join the uncertainty in what’s a beautiful, reflective song. Just like several songs on Swimming In Mercury, there’s a Beatles influence to Drinking Alone. It’s the choice of instruments used, the way they’re combined and the cinematic lyrics and vocal. Before that, the bass and guitars combine to provide the perfect backdrop for Boo, who delivers a weary vocal: “it’s only now and then that you head for oblivion, shipwrecked in a bottle again, Drinking Alone”. Later, when the vocal drops out, the strolling arrangement becomes wistful when trad jazz clarinets joins the guitars, bass and piano. Soon, a rueful Boo sings: “it makes you want to laugh out loud, as you think of that old crowd.” They’re just one of the costs of “Drinking Alone,” in this poignant and powerful song about someone who climbed into a bottle and sadly, can’t escape. Voice Behind The Curtain is a reminder that for a singer like Boo, the show must go on. It doesn’t matter if “his heart is hurting, hear you go again, stand in the spotlight taking what is yours.” They may receive applause, but deep down, their life can be a mess. However, onstage it’s a case of business as usual. Meanwhile, a guita, piano and later wistful strings accompany Boo on a song where he reflects on life as a modern day troubadour, in another carefully crafted song. The introduction to Swimming in Mercury, which closes the album is almost jaunty. Just a piano accompanies Boo’s vocal as he sings: “I was a boy growing in up in suburbia, you showed the future to me, skinny and pale, Swimming in Mercury.” By then, Boo has been transported back in time, as he delivers a tender, wistful vocal. He remembers: “we didn’t care, we went everywhere, Swimming in Mercury.” When Boo’s vocal drops out, the piano ensures the spartan arrangement seems to waltz along, all the time, painting pictures. Two years after the release of his last album Open, one of Britain’s finest troubadours Boo Hewerdine, makes a welcome return with the ninth album of his career Swimming In Mercury. It will be released on Reveal Records on ‘28th’ April 2017. It’s without doubt the finest albums of Boo Hewerdine’s long and illustrious career. Swimming In Mercury finds Boo Hewerdine in a reflective mood, as he looks back on his life and career so far on this carefully crafted autobiographical album. It features twelve songs, which range from ballads to uptempo tracks. The hooks certainly haven’t been spared by Boo Hewerdine on Swimming In Mercury. Some of the songs on Swimming In Mercury are beautiful, joyous, melodic, memorable poignant, powerful and thought-provoking. Others are melancholy and ruminative, and invite reflection about the subject matter. Many of the songs on Swimming In Mercury are cinematic, as Boo paints pictures with the lyrics on what’s an autobiographical album from one of Britain’s greatest singer-songwriter. For newcomers to Boo Hewerdine’s music, Swimming In Mercury is the perfect introduction to his burgeoning back-catalogue. Veterans of Boo Hewerdine’s music will embrace what is without doubt his finest album. Incredibly, it was recorded using just a four channels. 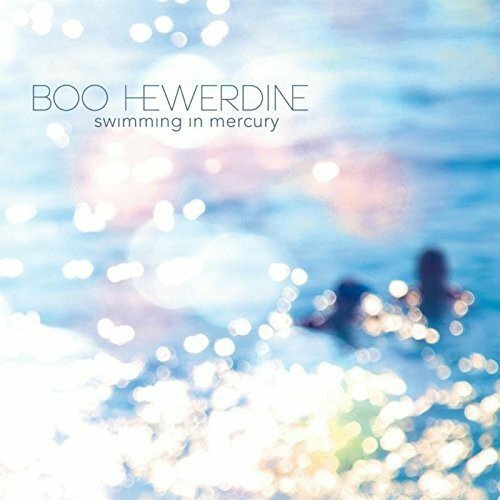 Despite this self-imposed restriction, Swimming In Mercury is the work of a true musical master craftsman at the peak of his powers as Boo Hewerdine reflects upon his life and career on this autobiographical opus. ← IAN MATTHEWS-VALLEY HI AND SOME DAYS YOU EAT THE BEAR…SOME DAYS THE BEAR EATS YOU.